A former crime scene frightens off 59% of buyers, according to real-estate website Trulia. 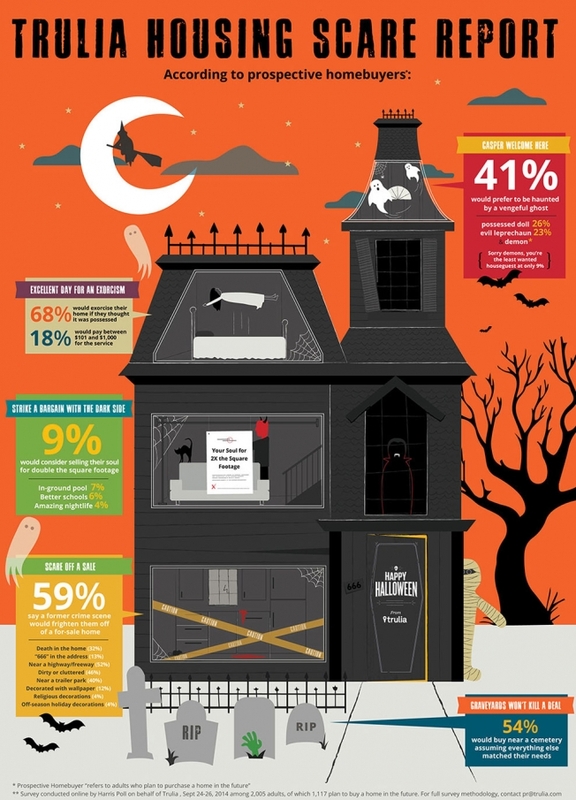 A death in the home would spook 32% of buyers and 13% are sketched out by a 666 in the address. Then again, 52% of buyers don’t want to live near a highway or freeway, either. Realtor® Cindi Hagley of The Hagley Group consults in both California and nationally to help “stigmatized homes.” Stigmatized homes may repel buyers due to murders, suicides, hauntings or celebrity status attracting tour buses (or all of the above). Seller’s disclosure laws vary by state regarding “phenomena stigma,” such as purported apparitions or hauntings, as well as revealing shocking murders that may have happened on-site. But fleeing a house isn’t easy, either – courts have ruled in favor of both buyers (who felt surprised by post-purchase hauntings) and sellers (who don’t always need to disclose murders or deaths). Few people set out to buy a haunted home, Hagley says, although plenty are curious. For example, these popular haunted-home listings on Realtor.com from around the country. Shoppers always want a deal, but most abodes in the current market don’t sit unbought, haunted or not. “It’s not as fascinating as you might think,” Hagley says. “You don’t have to discount a home.” But a creaky Victorian that doesn’t attempt to reimagine itself and sold by a less-experienced agent may be priced lower, however, or priced too high, in the belief that its “haunted” status may attract unique buyers. One downside of high-profile “haunted” homes: a particularly gruesome, newsworthy or unsolved murder can bring out amateur gumshoes determined to look under your rosebushes. “The Amityville horror house is a great example of that,” she says. In cases such as these, buyers may want to weigh the home’s notoriety with personal needs and whether it’s feasible to scare off the “looky-loos” as Hagley terms them. But unless you’re buying a new home, it’s not that unusual for someone to have died in a house, Hagley notes. It’s not difficult to research a home’s history via public records, a deep Google search, or even ask neighbors for deathly details. An older home can come with its own peculiarities, such as deferred maintenance, which could cause fear and dread -- pertaining to your bank account. Enterprising buyers may want to pick up a haunted home in order to convert it to a themed bed-and-breakfast. Some travelers want to sleep in a spooky suite in Lizzy Borden’s home and websites even list haunted B&Bs. But most houses on the market should encourage a buyer to see the home’s future – not its past. Mothers can be sensitive to homes involving murders, Hagley says. “We want to protect children at all costs,” Hagley says – but are often also come around first to envisioning the home as a safe place.